Last week, Bernal Heights neighbors rejoiced at the news that plans were in the works to build eight new apartments atop a revived Cole Hardware store on the now-vacant lot at 3310-3312 Mission Street where a devastating fire destroyed the original Cole Hardware one year ago, on June 18, 2016. Today, however, the fate of the project has been thrown into doubt, as the proposal is likely to become mired in the planning and permitting morass that has done much to perpetuate San Francisco’s ongoing housing shortage and affordability crisis. Under the original proposal reported by SocketSite last week, plans have been submitted to create eight market-rate homes in a new five-story building at 3310-3312 Mission Street. The ground floor of the building would include 6000 square-feet of commercial space. Reporting by Bernalwood revealed that Cole Hardware owner Rick Karp is collaborating with the owner of the property, with an eye toward re-opening the much-loved, much-lamented Cole Hardware store in the new building. Architect Earle Weiss has filed plans with The City to build eight condos over two stories of commercial space. Before the fire, there were seven residential units above Cole Hardware. Ronen said she would like for Cole Hardware to reopen, but also hoped the site would be used for 100 percent affordable housing. With just eight units planned for 3310-3312 Mission, the building is not large enough to trigger inclusionary affordable housing requirements under San Francisco’s current planning rules. Likewise, there is no requirement to use the building for 100% subsidized-affordable housing. Regardless, Supervisor Ronen’s comments suggest that the approval and permitting process for the building is likely to be long and acrimonious if Ronen and her allies oppose the otherwise code-compliant project at each of the many steps along the way. Cole Hardware wants to come back to Mission Street, but at the moment there’s no reason to believe that is going to happen anytime soon. PHOTO: The burned out lot at 3310-3312 Mission, where Cole Hardware once stood. Photo via SocketSite. Last November, many Bernal neighbors were thrilled to hear about Bernal Neighbors Christian and Elisabeth’s plan to open Skillshot Pinball at 1000 Cortland Avenue, on the corner of Folsom. However, it seems some nearby neighbors were decidedly less-thrilled about the plan, and now Skillshot Pinball’s grand opening faces significant delays as the proposal grinds its way through San Francisco’s bureaucratic maw. This is our first letter and we were hoping it might be more exciting, but it’s mostly about bureaucracy and the fact that we may not be opening as soon as we’d originally suggested. The space we’re seeking to occupy was not previously an eatery or drinkery so though it’s allowed by zoning, we have to apply for a change of use. This isn’t that big of a deal, except for anyone who’s not crazy about having an eatery or drinkery in the neighborhood, these applications allow them opportunities to protest the changes. And that’s what’s happening. We’ve had such a wonderful outpouring of support from Bernal neighbors and families, but all complaints, rightly so, must be properly heard out. Most of the issues surround concerns about noise and the effect on the neighborhood, but some concern mixing sales of beer with proximity to children. On our website we’ve got a list of those concerns and our approaches to how we deal with those issues. And we’ve met with some of the complainants, but we’ve been unsuccessful at changing their minds. They say they love the concept, they think it’s right for Bernal, and they like us, but they don’t want it right next to them. Ahem. So we’ve had, or are expecting to have, protests against our Change of Use with the Planning dept, our alcohol application with the ABC and separately with the ALU, and the Board of Supervisors approval of our alcohol application. Add that all up and it could be quite a while before we’re able to open. We’re trying to push things along, but it’s probably more like a year now, or even longer. The protests don’t usually keep you from getting the permit, they just significantly slow things down and put conditions on operations (like hours) so you guys don’t have too much to worry about. We’re still totally dedicated to opening up here on The Hill! In one of his final moves before departing the San Francisco Board of Supervisors, a petulant David Campos sided with Mission District NIMBYs to block the construction of 157 new units of mixed-income housing at 1515 South Van Ness, on the corner of 26th Street. As previously covered by Bernalwood, the proposed housing at 1515 South Van Ness would occupy the site of the former McMillan Electric (and Lesher-Muirhead Oldsmobile). Developed by Lennar Corporation, 1515 South Van Ness would be built with union labor, and it would include 39 units of subsidized-affordable housing, or 25% of the total units in the development. In a move that shocked city officials and housing advocates, the Board of Supervisors on Tuesday rejected a 157-unit Mission District development, claiming that city planners failed to take into account the impact the complex would have on displacement and gentrification in a district that has been the heart of the city’s working-class Latino community. The board unanimously upheld a challenge to the environmental review of 1515 S. Van Ness Ave., sending it back to city planners for further study. While the decision sent tremors through the city’s housing development community, it was uncertain whether the move signaled that future development proposals would be scrutinized for their impacts on gentrification and the displacement of residents and businesses from a neighborhood. Under the state’s convoluted California Environmental Quality Act, proposed developments require a painstaking analysis of everything from noise to air quality to traffic to historical and biological resources. Until now, however, efforts by antigentrification advocates to argue that displacement is a environmental impact have gone nowhere. The vote was particularly surprising because Supervisor David Campos, who represents the Mission District, had previously backed the project, which won unanimous approval at the Planning Commission. He had helped negotiate a deal under which the developer, Lennar Multifamily Communities, agreed to rent 39 of the 157 planned units to low- and middle-income families. That agreement marked the first time a developer had voluntarily agreed to make 25 percent of units affordable without receiving any benefits in return, like increased height or density. Campos said Wednesday that he likes a lot about the project, which calls for the redevelopment of a site previously occupied by McMillan Electric, but that he has been increasingly worried of the impact that large market-rate development will have on the Calle 24 Latino Cultural District, which was formed in 2014 to preserve the neighborhood’s Latino heritage and community. Campos also said he was upset by some of the rhetoric of those fighting the environmental review appeal, including members of the pro-growth group San Francisco Bay Area Renters’ Federation, known as SFBARF. At the hearing, SFBARF founder Sonja Trauss compared the antidevelopment activists to President-elect Donald Trump. It’s rare for an appeal of an environmental study to be upheld, and Tim Colen, executive director of Housing Action Coalition, said he never dreamed it would happen in this case. He said it was only the third time in a decade that such an appeal had been upheld in San Francisco. Earlier, a commenter said, “You’re bringing a stranger into our neighborhood,” as if it was self-evident that that was bad. As if everyone here could obviously see that that’s bad. And that disturbed me a lot. I’ve actually always been disturbed by nativism in San Francisco. In San Francisco of all places, we should not take for granted that bringing strangers into our neighborhood is gonna be a bad thing. The opponents of this project seem to know a lot about who’s gonna live there, which I think is mysterious. I don’t know how they would know that. The Mission Moratorium report that the controller’s office prepared last year said that in new buildings, 84% of residents are people that already lived in San Francisco, so the idea that– If this building was filled with newcomers, first of all, so what, right? In Trump’s America we’re already disturbed by nativism everywhere. We don’t like it. And when you come here to the Board of Supervisors and say that you don’t want new, different people in your neighborhood, you’re exactly the same as Americans all over the country that don’t want immigrants. It is the same attitude. It is the exact same attitude. So basically, you can be the kind of person that’s ready to have new people come into your neighborhood or you can be the kind of person that wants to keep people different than you out of your neighborhood. I know what kind of person I am: I want to build more housing, I want more people to be able to live here, and I want a wide diversity of people to be able to live here. And I’m not going to pretend to know who’s going to live in that building. Thanks. 1296 Shotwell is 20 feet taller than current zoning allows, so an initial hearing at the Planning Department will be held on December 1 to consider granting 1296 Shotwell a required variance. 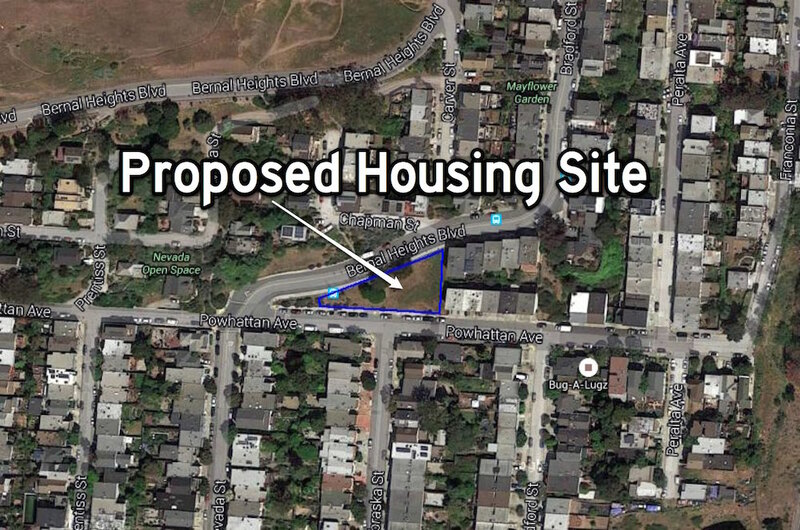 Last Thursday, July 21, the San Francisco Planning Commission unanimously approved a proposal by a Bernal-based developer to build four new homes on an undeveloped lot between Powhattan Ave. and Bernal Heights Blvd. by rejecting a request for discretionary review filed by neighbors opposed the development. The proposal calls for the construction of three new family-sized homes at 965, 985, and 1025 Powhattan, and one new home behind them, at 40 Bernal Heights Boulevard. The project will also include a new public stairway that will follow the path of the undeveloped Carver Street, which runs just east of the site. 40 BERNAL HEIGHTS BOULEVARD/965, 985, 1025 POWHATTAN AVENUE- the triangular-shaped project site is bounded to the south by Powhattan Avenue, to the north by Bernal Heights Boulevard, to the west by an undeveloped portion of Rosenkranz Street, and to the east by an undeveloped portion of Carver Street; Lot 010 in Assessor’s Block 5640 (District 11)- Request for Discretionary Review (DR) of building permit application Nos 2014.0521.6382; 2014.0521.6394-6396, proposing subdivision of Block 5640 Lot 010 to create four new separate lots and construction of one three-level single-family dwelling on each new lot within a RH-1 (Residential House, One-Family) Zoning District, Bernal Heights Special Use District and 40-X Height and Bulk District. This action constitutes the Approval Action for the project for the purposes of CEQA, pursuant to San Francisco Administrative Code Section 31.04(h). A group of more than 150 neighbors has filed for a Discretionary Review with the SF Planning Commission on the 4 large luxury homes to be developed along Bernal Heights Boulevard and Powhattan Avenue. The hearing before the SF Planning Commission on this development is scheduled for Thursday, July 21, 2016 at approximately 1 pm in Room 400 at City Hall. Join us at the hearing to let your voice be heard. The proposed development, in its totality, is out of context and scale with the established character of the Bernal Heights Neighborhood and sets a precedent for denser development. The proposed homes are not consistent with Planning Code, Residential Design Guidelines, Bernal Heights East Slope Building Guidelines, and General Plans (e.g. there are no Front Yard Setbacks). Safety Issues: Because there are no front yard Setbacks, a driver pulling out will be unable to check for pedestrians and traffic before crossing the sidewalk and entering the street. After much discussion and debate, all six of the the Planning Commissioners agreed, and the request for discretionary review was denied. A few minor revisions to the project were requested. That means construction on four new homes in Bernal Heights may begin soon. But this is San Francisco, of course, so who really knows? 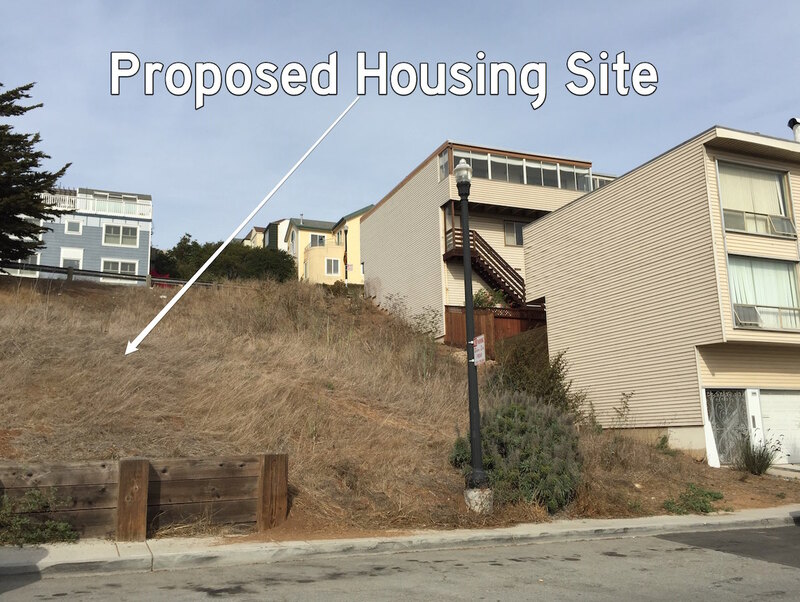 A group of Bernal neighbors hope the Board of Supervisors will overturn plans to build four new homes on a patch of private land where Powhattan and Bernal Heights Boulevard converge on the south side of Bernal Hill. A subdivision of the 7,500-square-foot, triangular-shaped lot at 40 Bernal Heights Boulevard was approved by the City two months ago, setting the stage for four new single-family homes – the building permits for which have already been requested – to rise across the site. As designed, the new two-story over garage homes would total 12,058 square feet of gross space, or roughly 3,000 square feet apiece, including garages and decks. The finished living space for the homes would average around 2,100 square feet each. And within ten days of being approved, an appeal of the subdivision was filed. 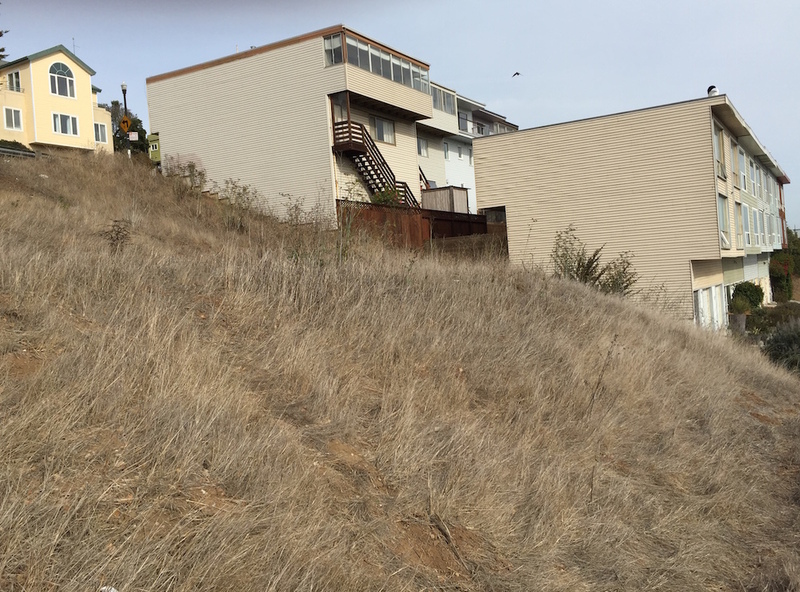 “This lot is one of the last open space hillsides on East Slope of Bernal, and offers commanding views to pedestrians, bike riders, car passengers, and commuters on the 67 Bernal Heights bus. The patch of land in question is certainly nice, and the views are terrific, so it’s easy to understand why those who live nearby excited by the proposed new housing. Except…. It’s not their property, and it’s not public property, and it’s unfortunate that a group of neighbors who themselves likely live in million-dollar homes are using the “luxury housing” trope to oppose the construction of new houses that would give a few more families the opportunity to become our Bernal neighbors. SocketSite says the Board of Supervisors will consider this subdivision during a meeting scheduled for December 1.